BERLIN (Reuters) - Volkswagen AG said a scandal over falsified U.S. vehicle emission tests could affect 11 million of its cars around the globe as investigations of its diesel models multiplied, heaping fresh pressure on CEO Martin Winterkorn. The world's largest automaker said it would set aside 6.5 billion euros ($7.3 billion) in its third-quarter accounts to help cover the costs of the biggest scandal in its 78-year-history, blowing a hole in analysts' profit forecasts. It also warned that amount could rise, saying diesel cars with so-called Type EA 189 engines built into Volkswagen models worldwide had shown a "noticeable deviation" in emission levels between testing and road use. The U.S. Environmental Protection Agency (EPA) said on Friday Volkswagen could face penalties of up to $18 billion for cheating emissions tests. In addition, the U.S. Justice Department has launched a criminal probe of Volkswagen, a source familiar with the matter said. The investigation is likely to examine not only possible violations of the Clean Air Act but also of broader statutes against wire fraud, false statements to regulators and other crimes, former prosecutors not involved with the investigation said. A Justice Department spokesman declined to comment. New York and other state attorneys general are also forming a group to investigate, New York Attorney General Eric Schneiderman said. “No company should be allowed to evade our environmental laws or promise consumers a fake bill of goods," Schneiderman said in a statement. The crisis has sent shockwaves through Germany, with Chancellor Angela Merkel calling for "complete transparency" from a company long seen as a symbol of the country's engineering excellence. Winterkorn was due to have his contract extended at a supervisory board meeting on Friday but is now facing questions about whether he knew about the automaker's use of software that deceived U.S. regulators measuring toxic emissions in some of its diesel cars. Volkswagen's executive committee plans to meet on Wednesday to discuss the emissions test scandal and the agenda of a full board meeting long scheduled for Friday, sources familiar with the plans said. A story in the Tagesspiegel newspaper - denied by Volkswagen - said the board would replace the 68-year-old Winterkorn with Matthias Mueller, the head of the automaker's Porsche sports car business. Winterkorn did not mention his future in a video message posted on the company's website in which he repeated his apology for the scandal. Volkswagen stock tumbled another 20 percent to a four-year low on Tuesday after some countries in Europe and Asia said they would launch investigations themselves. Preference shares were down 19.7 percent at 106.1 euros at 1500 GMT. At the lowest point, the declines in the preference and ordinary shares wiped more than $30 billion off the company's market value. Volkswagen was challenged by authorities as far back as 2014 over tests showing emissions exceeded California state and U.S. federal limits but held off on admitting wrongdoing until regulators threatened to withhold certification for its 2016 diesel models that Volkswagen in early September. In the United States, where diesel vehicles make up much less of the market than in Europe, Volkswagen is a dominant player in the segment, accounting for about one fifth of diesel light vehicles sold last year, according to auto industry consultant LMC Automotive. Ward's Auto, another consultant and publisher, said diesel vehicles made up 2.6 percent of the U.S. new car market so far this year, compared with 2.3 percent for electric-gasoline hybrid vehicles, also known for superior fuel efficiency. Volkswagen has spent $77 million so far this year on U.S. TV commercials lauding its "clean diesel" cars, out of $164 million budgeted for advertising thus far overall, according to iSpot.tv, a Bellevue, Washington-based company that tracks TV ads. Volkswagen has not made a decision on whether or not to pull its ads, a spokeswoman said. Winterkorn has built Volkswagen into one of the world's top-selling brands since he took the helm in 2007, with brands ranging from budget Seats and Skodas to premium Audis and top-end Lamborghinis and Bugattis. But he has also faced criticism for a centralised management style which some analysts say has hampered the company's efforts to address long-standing underperformance in North America. 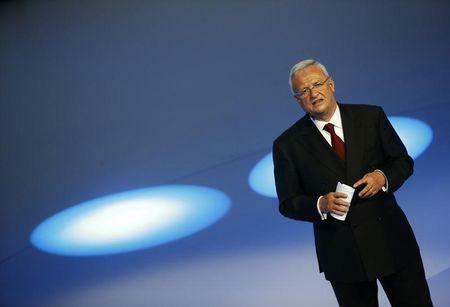 Workers in Wolfsburg, where Volkswagen employs over 50,000 people, were dismayed by the damage to the company's image. "If Winterkorn knew of the manipulation, then he must go," said one staffer who works in human resources at the plant. There have been no suggestions so far that other carmakers have engaged in the same practices as Volkswagen. 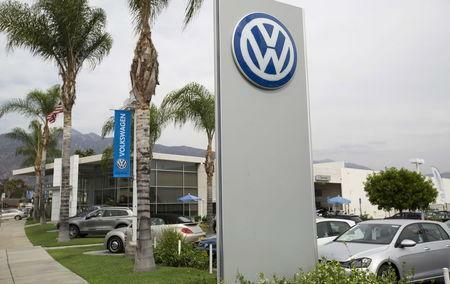 Germany's BMW and Daimler have said the accusations against Volkswagen did not apply to them. But shares in those companies as well as rivals including Peugeot , Renault and Fiat Chrysler fell on Tuesday amid signs regulators across the world will step up scrutiny of vehicle tests, which environmentalists have long criticised for exaggerating fuel-saving and emissions results. The EPA said on Monday it would widen its investigation to other automakers, and French Finance Minister Michel Sapin said on Tuesday an EU-wide inquiry was needed too. Canada's environmental agency said on Tuesday it is investigating some 100,000 Volkswagen and Audi 2009-2015 model diesel cars sold there, and is in contact with its counterparts in the U.S. EPA and Volkswagen's Canadian unit. It said the maximum fine for a potential breach of Canadian environmental law was C$6 million per offence for corporations. Germany's Transport Ministry said it would send an investigative commission to study whether cars built at Volkswagen's headquarters complied with German and European emissions guidelines. Italy asked VW to prove the cars sold in that country do not contain the "defeat devices" at the centre of the scandal, while Switzerland also said it would investigate Volkswagen's diesel vehicle emissions tests. The European Commission said it was in contact with Volkswagen and U.S. authorities, and it was premature to say whether specific checks on the carmaker's vehicles were needed. In Asia, South Korea's environment ministry said it would investigate 4,000 to 5,000 of Volkswagen's Jetta, Golf and Audi A3 vehicles produced in 2014 and 2015, and it could expand its probe to all German diesel cars if it found problems.